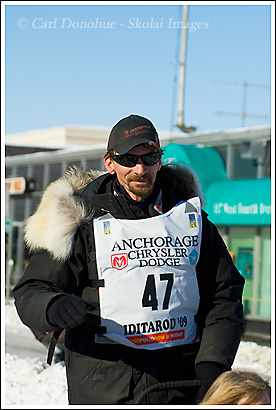 It’s that crazy time of the year again – Iditarod 2009. The ceremonial start of the race was held this morning, downtown Anchorage, and the weather was perfect – perfect for me, not so perfect for the dogs. The dogs like it colder than I do, strangely enough – but they’re probably working harder. This photo is Lance Mackey, winner of the last 2 Iditarod races, and a favorite for this year as well. Unfortunately I’ll be in the backcountry and not following the race too closely, but I’ll try to check in and see how the race shape up. It’d be way cool if Lance makes it 3 in a row. This entry was posted in Adventures, Alaska, Anchorage, Iditarod, People, Winter and tagged Anchorage, dog race, dog racing, Iditarod, Iditarod 2009, Lance Mackey, mushing, sled dogs, snow, sports, Winter on March 7, 2009 by Carl D.
That dude is one tough ombre!